I'm working on a map view that detects new ice using Sentinel-1 together with Google Earth Engine. 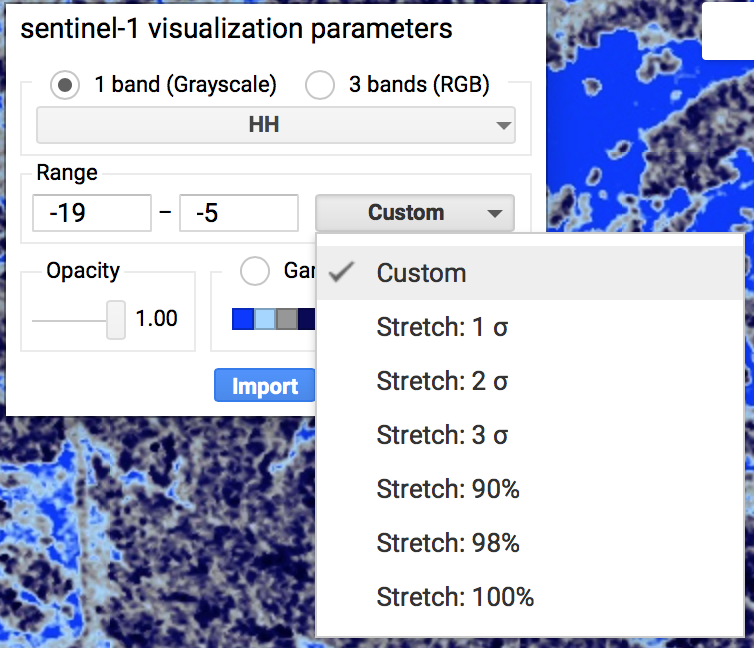 When adding images to Google Earth Engine I can set the min and max values for my layer in numbers but then in the map view I have the possibility to change change these values and also select different stretch options. I want it to be Stretch: 90% The reason I need to stretch the image each time is that they all look a bit different. If you want to stretch based on statistics for a fixed region, you can use the following approach, which demonstrates both percentage and standard deviation based stretches. // Function for displaying stretched image based on standard devitations from the mean. // Function for displaying stretched image based on percentile values. // Sample use - add layers with various stretches to the map. Note that the percentage based stretches are based on a histogram (see ee.Reducer.percentile), so the 100% stretch may not exactly match the extreme values within the sampling region. For stretching using the mean and standard deviation I wrote a function available in https://github.com/gee-community/gee_tools. I do not know how GEE does it when you do it as you mention (developers like as Noel Gorelick may know), but somehow it has slightly different values, see the test. Not the answer you're looking for? Browse other questions tagged google-earth-engine sentinel-1 or ask your own question. What are the min and max values of Map.addLayer on Google Earth Engine? Sentinel 1 Extra Wide in Google Earth Engine? Extracting color values from polygons drawn in Google Earth Engine?